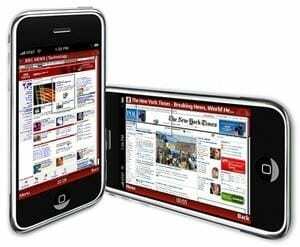 Undoubtedly the biggest iPhone question of the week is whether Apple will allow the Opera Mini iPhone browser, unveiled last week at the Mobile World Congress, into the App Store. Apple has a habit of rejecting apps that may step on the toes of their native apps, most notably rejecting the Google Voice application, which reportedly managed calls, voicemails and text messages. The circumstances around the announcement of the Opera Mini browser are interesting for two reasons. One, the browser is reportedly six times faster than the native Safari browser and uses less of the iPhone’s resources by rendering pages on a server and then compressing them by 90 percent. Second, Opera has forced Apple’s hand. By garnering significant media attention for the application before submitting it to the app store, Opera is daring Apple to reject their browser and feel the wrath of an undoubtedly disappointed customer base. The fact that Apple would reject an application that enhances a user’s experience simply because it conflicts with a native application will not sit well with many iPhone customers. Opera has also stated that they do not anticipate a problem with the Opera Mini being accepted into the App Store, affirming that it meets all the requirements Apple provides for acceptance into the App Store. The browser will be submitted to the App Store within the next few weeks, with the decision likely to shape Apple’s apps policy for the foreseeable future. Opera has deftly used the publicity and intrigue surrounding the Opera Mini browser’s acceptance into the App Store to make Apple finally comes to a definitive decision about allowing applications that overlap functionality with native ones. It only takes one to open the floodgates. You love your iPhone. And you’re lazy. Turning your iPhone into a remote or mouse? Sounds perfect. Blast supports your lethargy by giving you the three best remote apps for the iPhone. Remote– When Apple releases an app, especially a free one, we tend to pay attention. The app closes the gap between phone and computer by allowing users to control their iTunes or Apple TV over any wireless network. Remote is a simple yet effective app that gives users nearly complete control over their iTunes no matter where they are on their wireless network. Air Mouse Pro– This app allows you to use your iPhone as a trackpad and keyboard to control your PC or Mac. The application also has embedded action buttons to control each program. An interesting feature is the gyroscopic mouse control that, while not very functional and hard to control, allows users to wave their phone around to control their mouse, and appears to be one of the major selling points of the app. The UI is polished and the pre-loaded remotes allow users to quickly navigate running programs within seconds of setting the application up. Now only $0.99 on the App store, this app is an absolute steal. Rowmote– Rowmote, just updated last week, is like Remote, but for more than 30 programs, including Front Row, iTunes, Quicktime, Last.fm, Hulu Desktop, and perhaps most importantly, Keynote, considering Apple’s Keynote Remote app is the same price, $0.99. The application only has five functions for each program (pause, play, skip, fast forward/rewind and volume) and can have a bit of a delayed reaction, but has enough redeeming qualities, such as sleep and wake functions, launching and subsequently switching between applications, and accessing the iTunes Visualizer, to make this app worth the purchase, especially for Keynote users.